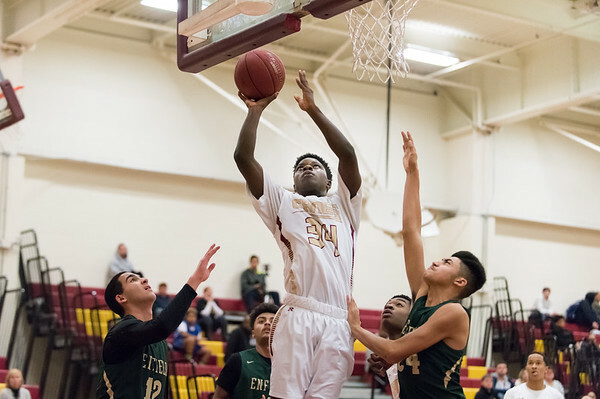 HARTFORD - The New Britain boys basketball team made sure to handle its business on the road against Bulkeley with the 80-53 win over the Bulldogs. The Hurricanes, led by Tomin Dupree’s 24 points, dominated the first half, outscoring Bulkeley 51-17 going into the locker room. Maurice Turner was the other Hurricanes player in double figures with 12 points. Dupree and Turner weren’t the only scoring options, though, as 10 different players scored for New Britain in the game. With the win the Hurricanes moved to 9-5 on the season. Innovation 83, Aerospace 45: Against a three win Jets team, the Ravens still brought their best effort to the floor and had a dominant 47 point second half en route to the win. It was a slow start defensively, though, as Innovation gave up 19 points in the first quarter. The Ravens, though, turned that around quickly. “After midway through the first quarter, I thought our guys did a great job making the defensive adjustments that really turned the game around in our favor,” Innovation head coach Matt Lance said. Lenny Okonya led the Ravens in scoring with 17 points. Carlos Gonzalez (14 points), Malcom Lewis (11), Lester Emmanuel (10) and Linwood Hazelwood (10) were the other Innovation players in double digits scoring. With the win, the Ravens moved to 7-5 on the season. Goodwin Tech 81, Vinal Tech 44: Being on the road didn’t deter the Gladiators from their winning ways. Goodwin Tech dominated the first half with 51 points in the win. Josh Peeples had a game-high 28 points. Frank Santiago (16 points) and Luis Aguiar (11) also were in double digits for the Gladiators. With the win Goodwin Tech still has just one loss on the season and moved to 12-1 with the win. Innovation 32, Aerospace 30: With little offense to be found, the Ravens found a way to escape with a victory. Kelsey Walicki hit a 3-pointer with 1:08 left in the game, which ended up being the game deciding basket. The defense, however, made up for the lack of offense as Innovation didn’t give up double digits in any quarter. Walick finished with 11 points, Bailee Nardi had eight points and Stefany Ferguson also chipped in eight. Christina Nazario-Fernandez was a force on defense with nine blocks, one coming with 37 seconds remaining in regulation. She also had eight rebounds for Innovation. With the win, the Ravens moved to 7-9 on the season. New Britain 58, Bulkeley 29: The Hurricanes were dominant in all facets of the game in the easy win over the Bulldogs. Bulkeley struggled to score and were especially off in the second and fourth quarters, with just nine combined points in the two. “It was a great overall team effort on defense,” Hurricanes head coach Marc Wesoly said. Gabby Roy led New Britain in scoring with 18 points. Maya Slisz added 10 and Inanna Rice had nine. With the win the Hurricanes moved to 5-10 on the season. Windsor 55, Newington 50: The Warriors just edged out the Indians and the 27-19 advantage in the first half of play proved to be critical. Newington was led by four players - Sabrina Soler (12 points), Ashanti Frazier (17), Olivia St. Remy (11) and Maya Gajowiak (10). With the loss the Indians fell to 6-8 on the season. Plainville 90, Meriden Co-op 90: Joe Michalic qualified for states in the 200 freestyle while winning the event He also finished first in the 100 freestyle. Taegan Brochu won the 50 freestyle and 100 butterfly. Josh Donagy qualified for states in the 50 freestyle. Both the 200 and 400 freestyle relays came in first with season best times. Michalic, Graham Eyres, Marcos Gutierrez and Brochu made up the relay teams. Plainville also had personal bests from Matt Lagassey and Zach McGough in the 500 freestyle. Kyle Sullivan had his personal best time in the 100 back. Posted in New Britain Herald, Goodwin Tech, Innovation, New Britain, Newington, Plainville on Tuesday, 30 January 2018 23:02. Updated: Tuesday, 30 January 2018 23:05.